Back in Stockholm. Whatever for? I was asked. It is true that I was in Malmo three weeks ago for the launch of the Malmo Commission on a Socially Sustainable Malmo, and in Stockholm in January. The answer is simple: our social movement on SDH is alive and thriving in local government in Sweden, and they wanted my continued input. I went first to the Parliament for lunch as the guest of Anders Jonsson, a paediatrician who is a Centre Party MP, and secretary of the Social Committee. Paediatricians are naturals for social determinants of health because the effects on children are so plain to see. Anders Jonsson had invited other doctors who are MPs or otherwise involved in politics. Barbro Westerholm, who is a senior advisor on our European Review, gave a refreshing account of what it means to be an MP. She had been head of the Swedish Board of Health. After retiring from there she became an MP. But, she said, after a while she recognised that she had run out of fresh ideas and so left parliament to work with organisations devoted to the elderly. Working with Civil Society, she developed a bucket full of ideas, and so came back to the Parliament. I joked to the Local Government people the next day, that the Parliament is a fact-free zone – my powerpoint would not load at the post lunch seminar that I was giving to the Parliament’s social committee. So I had to ad-lib it or, as I put it, talk ideas rather than data. There is a recognisable debate in Sweden across the political spectrum about the role of the state and the individual, but it is different to the UK. I have been told that it was Labour’s Clement Attlee (couldn’t track the quote on Google) who returned from a trip to the US and explained to his fellow Labour Parliamentarians: They have two political parties in the US. The Republicans are a lot like our Conservative Party; and the Democrats are a lot like our Conservative Party. If the right-left debate in the US is to the right end of the spectrum, the UK debate is further toward the centre, and the Swedish debate is further to the left. It was put to me that none of the major parties seriously question the Swedish welfare state. 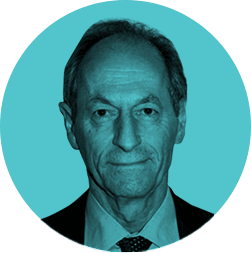 The Social Democrats may have to have given way to a Centre-Right Coalition for two elections in a row, but the legacy of decades of Social Democratic government is more or less intact. And Sweden looks pretty good – on life expectancy, low levels of child poverty, relatively high equality on UNICEF’s Report card on children’s living conditions. And, of course, their economy is doing well. 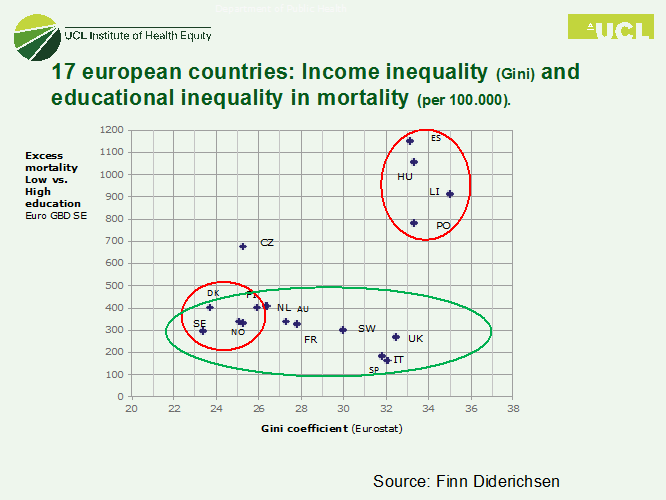 But, as I have previously reported, questions have been raised about the magnitude of health inequalities in Sweden. 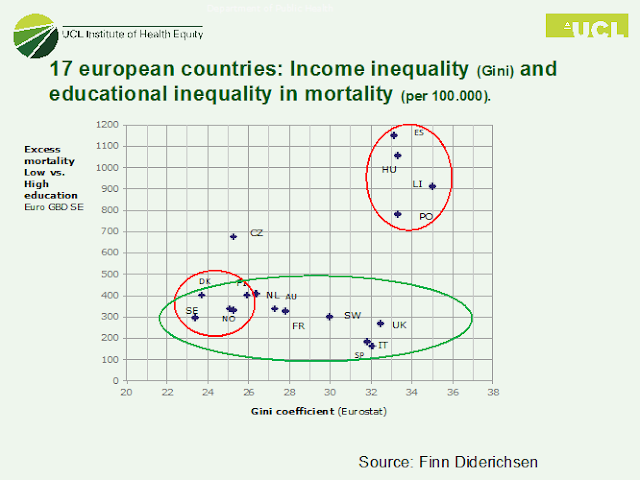 The graph above, from Finn Diderchsen, using data from Johann Mackenbach’s latest effort, shows that the countries of Central and Eastern Europe have a high Gini coefficient – although not much higher than the UK – and high educational inequality in mortality; the Nordic countries have low Gini and low inequality in mortality. BUT, and this is the so-called Swedish paradox, health inequalities in Sweden appear not to be narrower than in other West European countries with higher Gini coefficients, and less generous welfare states. Two comments. As we learnt from Olle Lundberg and CHESS: health of the most disadvantaged has been improving in Sweden. This is a societal success. Whether due to the welfare state, or not, it is a major societal success. One criterion of societal success is precisely improvement in the lot of the worst off, and Sweden looks good. But inequalities are increasing – this a second challenge that must be faced. Espin Dahl from Norway points out that if you look at self-reported health rather than mortality, the picture is different. Now, he sees that the more generous is a country’s spending on welfare the NARROWER are health inequalities by education. More to do on this agenda. The Local government conference – SALAR, Swedish Association of Local Authorities and Regions – was inspiring. 300 representatives of at least twenty local areas came together to make their commitment to pursue local policies for health equity, very much based on Closing the Gap in a Generation, the report of the CSDH. This IS our social movement in action. Inspiring! This should be taken and shared with Africa. We can do it there too; the journey may be yet to start, but we need to take that first step.